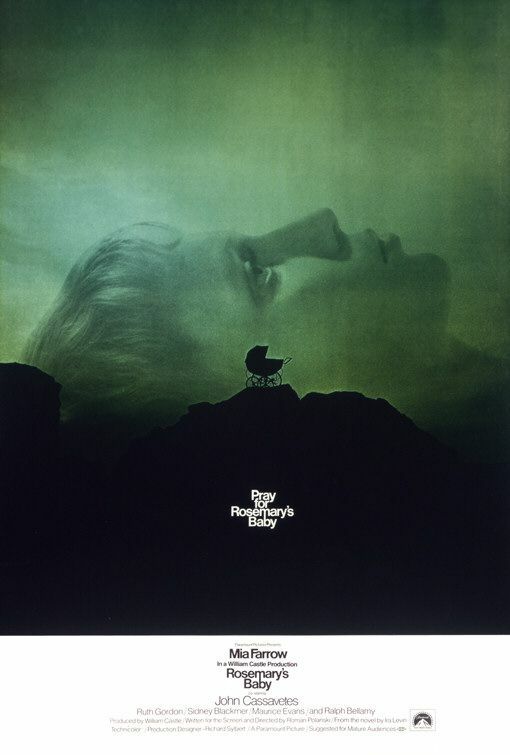 ROSEMARY'S BABY is considered one of a handful of late-60s/early-70s horror landmarks (others being THE TEXAS CHAINSAW MASSACRE and THE EXORCIST) that forever put to rest the old-school Universal Pictures/gothic scare tactics of walking mummies, wolfmen, Frankensteins, and tuxedo-wearing Dracula with his bobbing bats on strings. Filmmaker Roman Polanski's tense modernization of shocks depicts witchcraft and devil-worship of the worst kind going on in sophisticated, space-age Manhattan, finding a new language of urban paranoia, not cobwebs or castles of yesteryear. Yes, speaking of Castles, the producer was gimmick-impresario William Castle, of THE HOUSE ON HAUNTED HILL, THE TINGLER, MR. SARDONICUS and various other horror-suspense potboilers of variable quality and merit. I'm given to understand that Castle dearly wanted to direct the adaptation of Ira Levin's bestselling novel himself, but at the insistence of Paramount Pictures he handed the reins over to up-and-coming Roman Polanski. Sure, some critics would probably cringe at the thought of Castle directing ROSEMARY'S BABY (not to mention original casting choices Jane Fonda and Robert Redford), and a few years ago there was a flap that Michael Bay had planned a ROSEMARY’S BABY remake, allegedly hooted down by angry horror fans. Yeah, right, the same pierced-and-tattooed demo who flock like lemmings to any sloppy SAW or SCREAM sequel; I can’t imagine them taking a stand like that. Even the Occupy Wall Street kids probably couldn’t wait for the new THE THING remake, the tools. But here’s the deal: A few years ago I finally got around to reading Ira Levin's classic source novel, and I found the whole thing is pretty much there on paper. Had Castle, Polanski, Michael Bay, Jerry Lewis or just about any competent filmmaker followed Levin’s Rosemary’s Baby literally, it would have been a fair chiller. Polanski just brought a little More Cowbell, an extra bit of verisimilitude, atmosphere, style and perfect casting to Levin's narrative of housewife Rosemary Woodhouse (Mia Farrow) moving into a Central Park brownstone residence with her actor-husband Guy (John Cassavetes). They make the acquaintances of the affable mini-society of other over-60 tenants (most of whom are played by great old-line actors such as Ralph Bellamy, Sidney Blackmer and the incomparable Ruth Gordon), many of whom take a very close interest in the young couple. Some have interpreted the movie as being anti-religion - or pro-Satan - but originator Ira Levin claimed no belief in the devil whatsoever; he just wanted to scare. What's undeniable is the feminist-nightmare vulnerability and victimization of a pregnant young bride by "society" (embodied by smiling but malevolent and controlling older folks), the medical establishment and her own ambitious husband. It gets away with a lot through sheer mood and setting, in the not-even-dangerous corners of the big city, with the echoing melodies of Beethoven's "Fur Elise" in the hallways and Rosemary's increasing hormones, disorientation and anxiety, ending with a situation in which the waiflike heroine literally doesn't have a prayer. There was a 1976 made-for-TV movie LOOK WHAT'S HAPPENED TO ROSEMARY'S BABY, with Patty Duke, that is barely an asterisk in the record books; I know Polanski didn't have anything to do with it. If one considers Ira Levin the true auteur of this property - and I have to say, that works for me - then know that shortly before he died not too many years ago the novelist/playwright wrote a continuation called Son of Rosemary. I don't think that it went over very well. Maybe someday I'll read the thing, but it almost seems to me that by that time Son of Rosemary came out all the Universal gothic vampire bats, mummies, wolfmen and Frankensteins were back...with cross-platform marketing blitzes, CGI and Real3D production values trumping the mature brand of horror that Levin, Polanski and William Castle unveiled in 1968.